Just in time for the springtime sunshine comes Toolroom Records’ next drum & bass excursion courtesy of production house Total Science, alongside new Hospital Records artist S.P.Y.. Featuring the vocal talents of songstress Riya, with DāM FunK providing the piano melodies, this is a track that easily gets you set for summer. 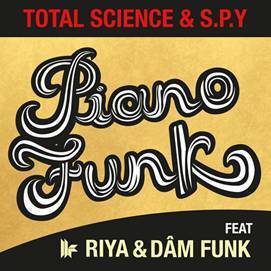 ‘Piano Funk’ is exactly what you would expect when two of drum & bass’ most prolific producers team up with possibly one of the most serene voices on the scene in Riya. Couple that with Boogie Funk DāM FunK and you have an instant vocal groover that combines clean breaks and warm bass over some rather lovely piano progressions to make this a real keeper. Out now. Check the video below.